A few weeks after the May coup against Dilma Rousseff by conservative parties backed by the country`s largest corporations, Brazil`s “interim” government, led by Michel Temer, signed an emergency loan to the State of Rio de Janeiro to help finance infrastructure for the 2016 Olympics – in particular for a subway line connecting the sports venues. The bailout was conditional to selling off the State`s public water supply and sanitation company, the Companhia Estadual de Águas e Esgotos (Cedae). When we interviewed City Councillor and chair of Rio’s Special Committee on the Water Crisis, Renato Cinco, in December 2015, he was already warning against such privatisation threats and provided important background information on the water situation in Rio. We are releasing a transcription of the interview. Renato “Cinco” Athayde Silva was elected to the City Council of Rio de Janeiro in 2012 as a member of PSOL, a Brazilian left-wing party created in 2004 in opposition to liberal measures taken by the Lula government. Born in Rio in 1974 and trained as a sociologist, Renato Cinco is Vice-President of the Commission on the Defense of Human Rights at the City Council and now chairs the city`s Special Committee on the Water Crisis, which is set to release its report after more than a year of investigation. Martin Pigeon was invited by the Committee for an international conference on the water crisis in the city, and used the opportunity to interview him (interpretation: Amanda Menezes L. de Castro). Martin Pigeon: Renato Cinco, who are you? Renato Cinco: My name is Renato Athayde Silva, “Cinco” (five) is a nickname I received at school and I have made it my political name. I am an activist of the revolutionary left, a socialist, a democrat and a libertarian. I belong to Insurgência, a Trotskyist political group within the PSOL (Socialism and Liberty Party), we are part of the reunified Fourth International (a transnational alliance of Trotskyist movements). I have been an activist since my student years and recently I have been particularly involved in the struggles against the prohibition of marijuana in Rio. Our campaign for this has been to “stop the war on the poor”: this criminalisation makes criminal gangs prosper, at the expense of entire neighbourhoods. I was elected to the City Council in 2012 in part thanks to the vote of young people because I am known for this, but that also means that the media tends to portray me only as a one-issue person. MP: What gave you the idea to initiate this Special Commission on the Water Crisis? RC: Before me there was no environmental activist on the City Council. Environmental issues were always on the radar for my generation, but were not necessarily seen as an emergency; there was not much action. 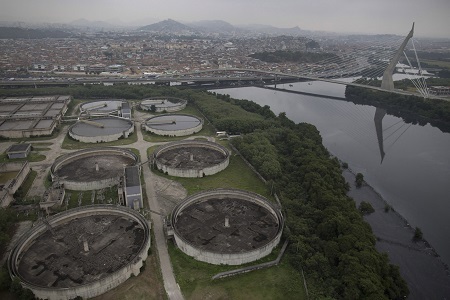 The dramatic ongoing water crisis in São Paulo caught my attention, in particular because of the risks for political destabilisation that it created. There were revolts, robberies... very quickly after water shortages started. I discovered in the Spanish newspaper El País that the Brazilian army had even organised exercises to seize control of the water system and, basically, the whole city in case they would consider it necessary! That tells you how serious the situation is. I started to publish posts on social media calling for materials and testimonies on the situation, and I realised quickly that this crisis had been announced for more than 10 years by specialists but that nothing had been done. In Rio, we are not there yet, although the perspective of water rationing is lurking and there are many areas with very irregular supply, sometimes no supply at all. The situation is not stable, but there is little information available. So, this was a situation where while the army was preparing to intervene, social movements seemed completely unaware of the danger. The idea for this Special Commission was to gather knowledge and disseminate it, inform people and plan ahead to try to avoid finding ourselves in the same situation as in São Paulo. For example, what are the basic measures needed to avert a humanitarian disaster in case of excessive water scarcity? Which large users is it possible to shut off to preserve water supply to the people? MP: What are the main characteristics of the water crisis in Rio? RC: I can think of four different aspects to it. The first problem is inequalities in coverage. Large parts of the city have been without water and sanitation for more than 10 years, especially in new neighbourhoods that used to be in the countryside but that have been included in the city due to its expansion. Water in these new neighbourhoods still comes from the old wells but is now polluted and not at all fit for human consumption. But the inequality is not only geographic, it is very much social: while water reservoirs are in the North, residents don`t get much of it there as it first goes to the rich neighbourhoods in the South of the city. And even in the South, inhabitants of the favelas (slums) that are next to these rich neighbourhoods do not get access to water supply and sanitation systems either. The second problem is water leakage. Officially, Cedae (Rio`s public water company) declares a leakage rate of about 30 per cent, which is high, but we do not know how reliable this figure is and it could very well be higher. The third problem is the absence of transparency. Our own Committee has struggled to access really basic information about water uses in the city. Cedae told us that about 43 per cent of the water used in the city is for industrial use, 16 per cent for mining and agriculture and 41 per cent for “urban uses”; but what are “urban uses”? This combines domestic and commercial uses, and we do not really know for instance how much is used by large users such as big hotels and what is used for basic, domestic consumption. We know that at the level of the state of Rio this is about 6 per cent only, while agriculture uses 70 per cent, but that includes a much larger area. Lastly, the city of Rio is a big consumer of water but not a producer. Our supply comes mainly from the Rio Paraíba do Sul, which also supplies São Paulo. This river is quite polluted and the fact that we share with São Paulo leads to regular conflicts. MP: Your party is in the municipal opposition while the current city council is dominated by the PMDB. What are the priorities of the political parties in power in Rio as far as water is concerned? MP: Isn`t such a blunt description a bit excessive? RC: It is not! Parts of the network have already been privatised, with a 30-year concession contract signed in 2012 with a company called Foz Águas 5; this company has a partnership with Odebrecht and the private water company Águas do Brasil. This contract deals with developing areas of the city (Planning Area Five, which includes 21 districts of the West Zone in the city of Rio de Janeiro) where there is a lot of construction work to do to extend the network. Now it happens that Odebrecht finances the political campaign of the governor of the state of Rio, and the company`s owner is now in jail after having been investigated in the Petrobras corruption scandal. This is huge: it`s the first time in the history of Brazil that anything like this happens. We will have elections in late 2016 here and for the first time direct funding of political campaigns has been forbidden, only individuals can contribute, with a cap... You know, this sort of deal is not uncommon in Rio. You must have heard of the Maracana, one of the largest football stadiums in the world. It was built and renovated with public money but it got privatised in 2013 with a 30-year concession contract to... Odebrecht, again, together with other companies. MP: It looks like the most pressing need in the city is the extension of the sanitation network but the cost of such works is typically prohibitive, especially for a private company. How do they intend to proceed, if at all? RC: Well, as far as as Foz Águas 5 is concerned they cannot indeed recoup the cost of the works only with water tariffs so they`re getting public subsidies for that from the city. Also, their contract says that they do not have to extend the network to favelas (slums). Sixteen per cent of the population in the West Zone would have no access to the water supply network, access to sanitation is certainly lower but this is the kind of information that we could not access, even for the whole city. That said, Cedae also receives public subsidies. MP: Are there plans by the city to privatise the water and sanitation networks also in the centre and in the south, where Rio`s richest neighbourhoods are located? RC: Not that I know of. The main interest of the company seems to be subsidised construction projects more than managing these networks. This also echoes a federal policy, actually: today, there are an estimated five million homeless people in Brazil and six million empty apartments, but the government only talks about building more of them. MP: I was surprised that there was no representative of Cedae at this international conference on the water crisis in Rio. Why was that? RC: This is because we had organised a hearing with them and the Commission [on the Defense of Human Rights in the City Council] a few weeks earlier, so this was to avoid a repetition. MP: What did you learn during this hearing? You know, Cedae is technically a public company but it is very entrenched. Any social control of the company is very fragile for the moment: a lot depends on the executive, on managers who are co-opted and appointed by the usual ruling parties in Rio... The company is very much out of reach for us. MP: What are your ideas to make the situation evolve for the better? RC: This is difficult as the problem has so many dimensions and there is only so much we can do at our level. First of all we would need to stop wreaking the climate and this can only be done at the international level, we all know how easy this is! Then at the national level we would need to stop destroying the forest and start reforesting, and here too there are very powerful interests – especially large-scale farming but also mining, construction... – against us. Then at the local level we need to tackle management shortcomings but also fundamental social and environmental justice issues. It`s very much a question of democracy. You know, Brazil is miles away from the European welfare system, here we have the “badfare” system! The dominant vision and priority is to intensify capitalism, not fight it. Still water is an area where the contradictions of this logic quickly become untenable; I hope the work and recommendations of our Commission will be heard and make a difference for Rio`s people. Photo: Rio’s filthy water in a 27 July 2015 aerial photo showing the Alegria Sewage Treatment Plant, located alongside the Guanabara Bay. Source: AP.